Naike Spiral plate heat exchanger is a highly efficient heat exchanger equipment,application of steam-gas,steam-liquid,liquid - liquid,the heat transfer fluid. Naike Spiral plate heat exchanger is a highly efficient heat exchanger equipment, application of steam - gas, steam - liquid, liquid - liquid, the heat transfer fluid. It applies to the chemical, oil, solvents, medicine, food, light industry, textile, metallurgy, steel rolling and coking sectors. The structure can be divided into non-demolition (Ⅰ type) spiral plate and removable (Ⅱ type, Ⅲ type) spiral plate heat exchanger. 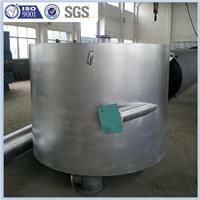 1. the equipment formed by the two rolled, the two formed a uniform spiral channel, two heat transfer medium-wide counter-current flow can be greatly strengthened the effect of heat transfer, even small temperature difference between the two media, can also achieve the desired Effect of heat transfer. 2. in the shell of a cut to take over the structure, local resistance small, spiral-channel due to the curvature is uniform and equipment in the liquid flow there are no major shift, the overall resistance small, thus improving the design flow so that it has more High heat capacity. 3. I can not be demolished screw-plate heat exchanger end of the spiral channel sealed by welding, which has a high tightness. 4. II-type removable plate heat exchanger spiral structure of principle and can not be demolished heat exchanger is basically the same, but one channel can open cleansing, in particular with regard to the viscous, liquid precipitation heat exchange. 5. III-removable plate heat exchanger spiral structure of principle and can not be demolished heat exchanger is basically the same, but the two channels can open cleansing, apply a wider scope. 6. single-use devices can not meet the requirements, you can use multiple combinations, but the composition must meet the following requirements: Parallel composition series portfolio, equipment and the same channel Pitch. Mixed combination: a parallel channel, a channel series.